Anne Lister - scholar - heiress - lesbian - traveller - owned and ran the Shibden Hall estate in Halifax. 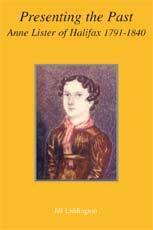 Her four-million word diaries give a vivid picture of the daily life of an independent woman in the early nineteenth century. In Presenting the Past, Jill Liddington tells the dramatic story of how the diaries and letters have survived since Anne Lister's death in 1840. She recounts how the code, in which Anne recorded her lesbian affairs in her journals, was eventually deciphered. Successive generations of historians and editors have selected and presented their version of the Anne Lister story. Taking the reader into the Archives where the Shibden Hall papers are preserved, Presenting the Past offers the first critical reappraisal of these very different images of Anne Lister. The 'case of Anne Lister' as presented here by Jill Liddington has the attraction of a detective story . . . Anyone with an interest in the past and in how views of the past have been created, will be fascinated by this volume. Professor Leonore Davidoff, Editor, Gender and History. The Life and Times of a Respectable Rebel: Selina Cooper 1864-1946. The Long Road to Greenham, Virago Press 1989 won the Fawcett Book Prize in 1990. Jill Liddington contributed to Gentleman Jack from Halifax, a programme about Anne Lister, broadcast on BBC Radio Four.